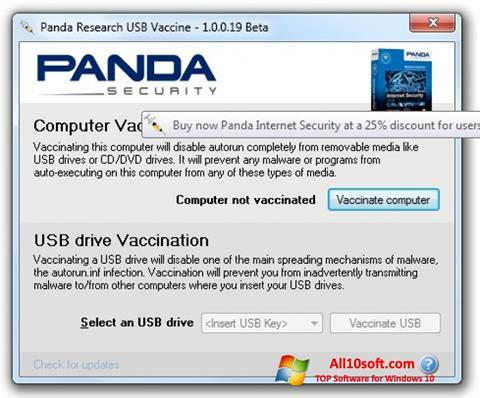 Panda USB Vaccine for Windows 10 - tool to lock AutoRUN files on removable drives. The application provides a detailed scan of NTFS, FAT disks and optical drives, knows how to find modified startup elements, neutralizes the threats spread through data download. The utility includes means of preventive protection, is capable of disabling the automatic launch of any interfaces, and supports a quick reset of changes. It processes the existing autorun files, changes the access rights and attributes of reading, writing, allows you to protect USB drives from encryption viruses. You can free download Panda USB Vaccine official latest version for Windows 10 in English.